The anatomy of a good song is pretty obvious --- distinct voice, tight instrumentation, lyrics that rattle from the soul --- but what makes a song truly stand out to me is the afterglow effect. How it lingers long after the fade out. 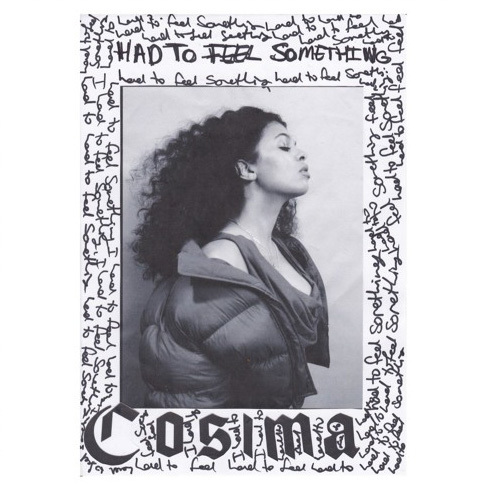 Cosima's "Had To Feel Something" has that lingering effect. "Had To Feel Something" truly is quite the first impression to this Peckham-raised newbie, who gained a bit of buzz when she appeared on Lil' Silva's deliciously spastic, "Caught Up" earlier this year. The first time I listened to it, Cosima's silken alto struck me (think Meshell Ndegeocello at her most cerebral moment...), then the heady haunting of blending basslines and lonely guitar strums seeped in next, along with such fraught lines as "every day is a Monday, and there's no hope for Friday". Of course, I knew this was a good song as songs about inner angst and loneliness have a lasting kinship with me. It also gets the good stamp because doesn't sound like any of the zillion other future soul cuts out there which is a plus, as nothing bores me more than clones of clones, but "Had To Feel Something" invites you to that second, that third listen, it's really resides in your conscious. Try to play it once and not think about it. Go on. Try it. I bet you can't resist the temptation.